The Brazilian (or Lowland or South American) tapir, Tapirus terretris, is the most widespread of all extant tapir species and the least threatened. It was classified by Western scientists in 1758. The Brazilian tapir is dark brown, paler in the face, and has a low, erect crest running from the crown down the back of the neck. 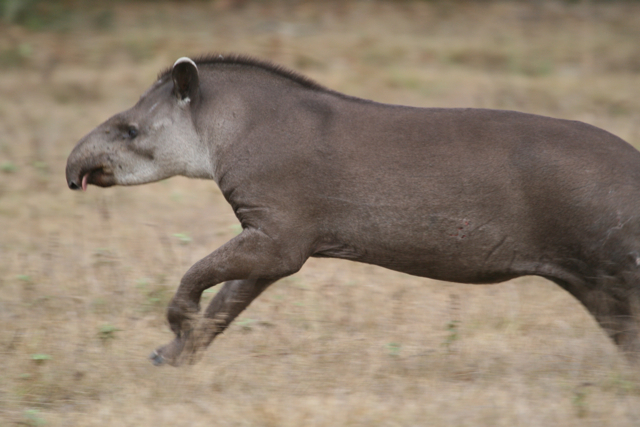 On some Brazilian tapirs, the crest is a darker brown or black, whereas on others it is lighter in colour. The round, dark ears have distinctive white edges. 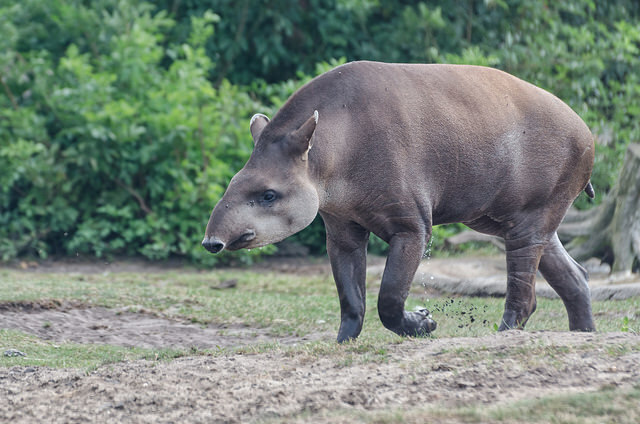 They have have a stubby, vestigial tail, and like all other species of tapir, have a flexible proboscis and four hooves on front feet and three hooves on rear feet. 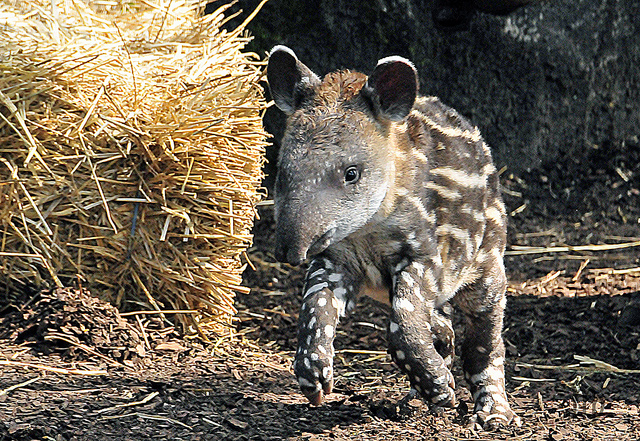 The Brazilian tapir can attain a body length of 1.8 to 2.5 m and an average weight around 225 kg (496 lb). Adult weight has been reported ranging from 150 to 320 kilograms. The Brazilian tapir can be found near water in the Amazon Rainforest and river basin in South America, east of the Andes. Its range stretches from Venezuela, Colombia, and the Guianas in the north to Brazil, Argentina, and Paraguay in the south, to Bolivia, Peru, and Ecuador in the West. Whilst this range is extensive, the rapid deforestation of much of it is placing an increased threat of local extinction on many populations. In 2002, the IUCN classified the Brazilian tapir as Vulnerable for the first time, due to an ongoing population reduction, which is estimated to be slightly greater than 30% in the past 3 generations (33 years) due to habitat loss, illegal hunting and competition with livestock, and estimated on current rates of decline this rate of decline is inferred to continue for the next 3 generations (33 years). Although only about 15-20% of the Amazon has been deforested in the past 30 years, 90% of the Atlantic forests have disappeared and 40% of the Pantanal has been converted to human use. The effects of deforestation, hunting, and competition from domestic livestock have all contributed to population declines and fragmentation in the past and are likely to continue at the present rate (if not more) into the future. Deforestation is increasing in parts of the species' range, while subsistence hunting and a developing bush meat industry may cause further declines in the future. The Brazilian tapir is now either completed absent or severely fragmented across much of its historic range, with the Northern Amazon and the remaining Pantanal (Bolivia, Brazil, and Paraguay) becoming important strongholds as southern, eastern and northwestern populations declining rapidly.